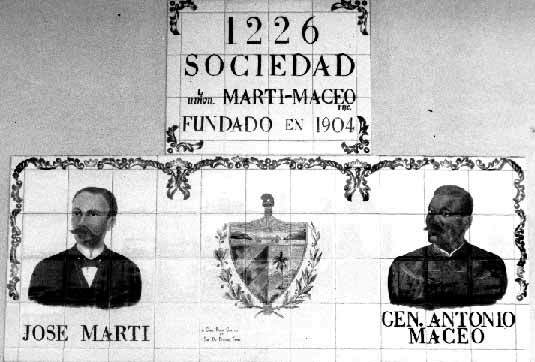 Sociedad La Union Martí-Maceo is a mutual aid society that was founded by Afro-Cuban patriots in Tampa in 1900. The club originated in 1899, as an integrated organization of both black and white Cubans. In October of 1900, however, the group split along racial lines due to the pressures of the segregated South. Both clubs are still in existence. They held a joint centennial celebration in 1999 through to the fall of 2000. A Florida Humanities grant funded a series of programs and photo exhibits in both clubs. The Martí-Maceo Society is facing a serious financial crisis that may jeopardize the celebration of its long life up to now. Changes in Ybor City, the Historic section of Tampa where the social hall is located, have caused a dramatic decline in rental revenues for the hall, which has been the principal source of income that has kept the society going. The building also has a leaking roof and has been cited for the condition of its exterior paint job. Projected costs of those two repairs alone exceed the current level of the treasury. Without some infusion of financial support, the club could be forced to close its door. The other immigrant societies in Ybor City (Spanish, Italian, and white Cuban) are eligible for large historic preservation grants to keep their buildings in good condition. Martí-Maceo is not able to get any of these funds, because their historic building was torn down by Urban Renewal in 1965. The present structure is too young, and too architecturally plain, to qualify. This is a critical juncture. The members of the club have been working for nearly a year to develop a strategic plan to improve operations, recruit new members, and establish new bases for solvency. We desperately need some donations, of any size, to help bridge the gap and keep from losing the property. Anyone interested in learning more about this issue, should e-mail Michael Torres, president, at mttorres@gte.net. Contributions should be made out to Sociedad La Union Marti-Maceo; P.O. Box 76144; Tampa, FL 33675-6144. The Marti-Maceo Society, historic Afro-Cuban organization in Tampa, will celebrate its 100th birthday on November 12, 2000. This program is part of a year-long Humanities project that focuses on black and white Cubans in Tampa over the past century. El Circulo Cubano, the white Cuban club, is also celebrating a centennial this year. The two clubs, which began as a single integrated organization in 1899, split along racial lines in 1900. The birth of the Marti-Maceo society, named in honor of the Cuban independence fighters, was a paradoxical symbol of acquiescence to the Jim Crow regime in Florida. Prior programs in the series have explored the meaning of this divided Cuban community during the course of dramatic changes in both Cuba and the US. The upcoming program, which focuses on the history of the black Cuban club, is the last event in the series. On Saturday, November 11, Evelio Grillo will speak about his new book, Black Cuban/Black American (Artes Publico Press, 2000), at the Ybor City Museum, 1802 E. 9th Avenue; Tampa, Florida. Mr. Grillo, who was born in Tampa in 1920, has written a highly evocative autobiography much of which focuses on his early experiences as the child of Afro-Cuban cigar workers. He presently lives in Oakland, California where he retired after a long and distinguished career as a community activist and political consultant. On Saturday, March 4, 2000 the third program in the year-long celebration of the centennials of the historic Cuban social clubs in Ybor City - El Circulo Cubano and La Union Marti-Maceo - will take place at 2 PM in the Marti-Maceo social hall at 1226 E. 7th Avenue. The title of the program is The Social Vision of Jose Marti and Antonio Maceo. The lives and ideas of these two men, the most celebrated heroes of Cuban independence, have had a lasting influence on the Ybor City community. The event will examine this legacy and its special meaning for the two Cuban clubs and their members. Featured speakers include Alejandro de la Fuente, professor of history at USF; Judge E.J. Salcines, an expert on the local Cuban independence movement; and Remember Maceo Gomez, grand niece of Antonio Maceo. Felix Alonso (West Tampa resident and son of a leader in Tampa's Cuban independence movement) and Maura Barrios (assistant director of the USF Latin American/Caribbean Initiative and descendant of Cuban independence activists) will present a dialogue on family legacies of the values and ideals of Marti and Maceo. Introduction and welcoming remarks will be provided by Jorge Ledesma, President of Marti-Maceo. In addition to the speakers, there will be an exhibit of historical photos and artifacts in both social halls. (Circulo Cubano is located at 2010 Republica de Cuba Avenue.) The exhibits are part of a related event, organized by the Tampa Bay History Center, that features exhibits in all four historic social clubs of Ybor City. The Italian Club and Centro Asturiano also will have exhibits open to the public on March 4. A bus tour of all of the exhibits will begin at 10:00 AM at the Ybor City Museum (1818 E. 9th Avenue). For information about the bus tour, call the Tampa Bay History Center at 228-0097. The final stop on the tour will be at Marti-Maceo and will conclude with the program on Cuban independence. The afternoon program is funded by a grant from the Florida Humanities Council and is co-sponsored by the Ybor City Museum Society, La Union Marti-Maceo, and Circulo Cubano. The theme of program incorporates the values of racial equality and social justice that were espoused by both Jose Marti and Antonio Maceo in pursuit of Cuban independence in the late 19th century. Marti was a poet and essayist who organized the Cuban Revolutionary Party, the principles of which were drawn up in Tampa with the aid of local Cuban cigar makers. Maceo was a general in the Cuban Liberation Army, celebrated for bravery in battle, but also known for his ideas and ethical principles. These two men also embodied the dual ancestry of Cuba. Marti was white and descended from Spain; Maceo was mulatto, descended from Spanish colonists and African slaves. They were united in a desire to end to racial inequality in Cuba. Both were martyred in the cause they fought for - Marti was killed in battle in 1895, and Maceo also was killed on the battlefield in 1896. The life and death of both men are memorialized in statues in the Marti Park, at 13th Street and 8th Avenue in Ybor City. Marti Park also has special importance for the Cuban clubs of Ybor City. The park was created on the former site of the Pedroso house, where Marti stayed when he was visiting Tampa. The Pedrosos, Ruperto and Paulina, were Afro-Cuban patriots who sheltered and protected Marti and played a significant part in mobilizing support among Tampa's Cubans for the cause of independence. After the war, their house was also the site of early meetings of the Marti-Maceo Society, a mutual aid organization formed in October 1900 by Afro-Cuban independence activists and veterans. This organization resulted from a split between black and white Cubans in Tampa who previously belonged to a mutual aid society that was racially integrated (El Club Nacional Cubano). These same black and white Cubans had common membership in the integrated revolutionary clubs in Ybor City and West Tampa that raised funds and arms for the war in Cuba. The end of the war in 1898 coincided with the onset of Jim Crow in Florida. Pressures and dangers of this period made it impossible to maintain an integrated social club, and black and white Cubans have been divided into separate organizations ever since. The overall purpose of the joint centennial celebration, which began in October 1999 and will end in October 2000, is to examine the significance of this long separation and the common heritage that both clubs share. Paul Dosal, USF professor of history and past-president of Circulo Cubano initiated the idea of a shared centennial and wrote the grant proposal to the Florida Humanities Council. Susan Greenbaum, USF professor of anthropology and honorary member of Marti-Maceo, is co-director of the project. Two more events are scheduled in the series - a panel on April 30 at the Ybor City Museum and a 100th birthday celebration on October 22 at the Marti-Maceo Society. For information about all the events in this series contact Paul Dosal, 974-6177, or visit the Marti-Maceo website, www.cas.usf.edu/anthropology/Marti-Maceo. Gloria Rolando, who directed Oggun, My Footsteps in Baragua, Eyes of the Rainbow, and other films, appeared at a fund raiser in Tampa for la Sociedad during Thanksgiving week in '99. She is currently working on a film dealing with the 1912 massacre of the Independents of Color. The Sociedad continued in Florida in the same Marti Maceo line that the Independistas took. UT learns from author's experience, St Petersburgh Times, 10/26/2001: "Evelio Grillo, author of Black Cuban, Black American, stands in front of the Sociedad La Union Marti-Maceo club in Ybor City. Grillo, who grew up in Ybor City, said he has fond memories of the club."